A fabulous Opal ring for men with an oval Opal accented with quality Diamonds set in a heavy 14k Gold ring. In stock and ready to ship. This Opal and Diamond ring for men projects a statement of style. 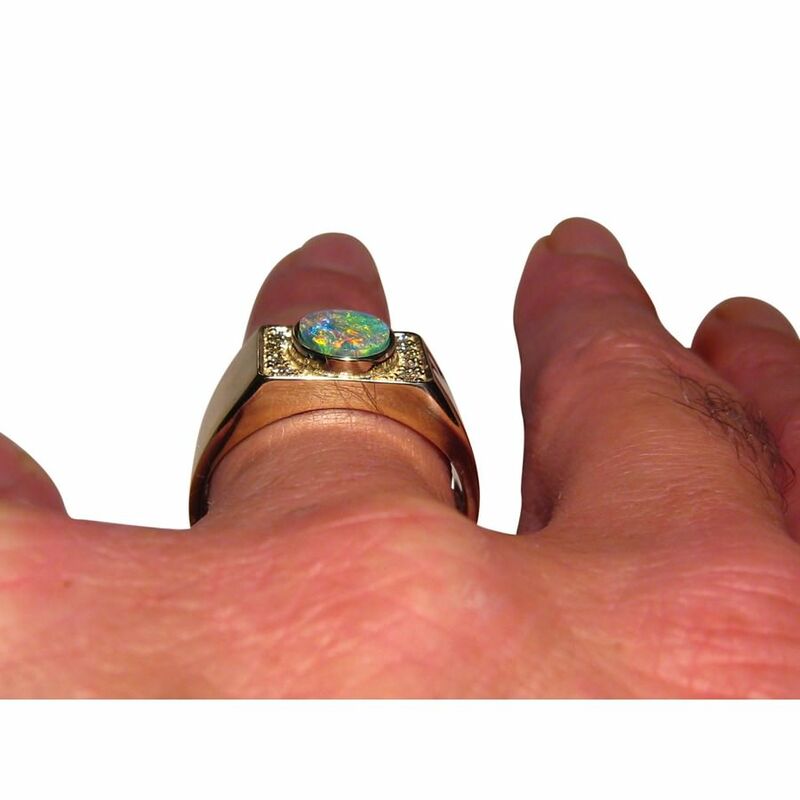 The ring is a 14k Gold wide band that weighs a heavy 20 grams and has a smooth finish on the shank with the top of the ring a rectangle that is set with an oval Lightning Ridge Opal. On either side of the Opal is a line of Diamonds with the the four corners set with the largest Diamonds of 2 mm and the three other Diamonds graduating in size. The Opal displays a mix of very bright colors including Red and the video below will show the play of color in the Opal, the high shine of Gold and the dazzling Diamonds. This is a quality Opal ring for men who like their rings to be noticed and admired and is ready to ship as shown in 14k Yellow Gold size 13 USA. If you need any other ring size or prefer White or Rose Gold, allow at least 14 days for the ring to made before this exact Opal will be set and shipped to you. As the Opal is not yet secured, the ring design can be made with changes such as a textured finish or different size Diamonds and you can contact through this product for a no obligation price quote.